Ames Color-File Mini BRUTE Two-Pocketed Organizers (Red) - available at Staples.com via our site. Use our links and Staples coupon codes for Staples promotions. Visit our Filing Supplies catalog page for more good deals. 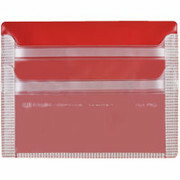 Want to buy Ames Color-File Mini BRUTE Two-Pocketed Organizers (Red) from Staples? BRUTE Organizers are 14-1/2" x 21"
Mini BRUTE Organizers are 10 3/4" x 13 1/2"
Looking for more Filing Supplies products? Try the Ames Color-File Negative Preservers, 10 1/2" x 12 1/2". Another product to consider is the Smead Slash Jackets, Letter Size, Assorted Colors, 25/Box.